Bhai Harjeet Singh Dhillon was born on July 30, 1967 into household of Sardar Joginder Singh and Mata Tarvinder Kaur of village Dhilwan. Bhai Sahib was from a humble and deeply religious family; the entire family had been blessed with Amrit and led a Gursikh lifestyle. Bhai Sahib’s grandfather Subedar Major Ujhagar Singh was a saintly figure who regularly accompanied Sant Jawala Singh Harkhovale. Bhai Sahib’s uncle Sardar Mohinderpal Singh Dhillon was a well known and very successful businessman settled in England. Bhai Sahib’s grandmother Bibi Harnam Kaur was of a very caring and loving nature. Each family member’s individual attributes and the household atmosphere contributed to Bhai Sahib’s strong belief in the Sikh faith and desire to be of service to the Panth. Bhai Sahib was an intelligent student who excelled in sports, particularly in Kabbadi. Bhai Sahib completed his higher education at the local village Government Senior Secondary school then did prep at DAV College, Jalandhar in 1983, before being granted admission at Mehar Chand Polytechnic College, Jalandhar. Like many of Punjab’s students Bhai Sahib visited Sri Darbar Sahib several times and with great interest would listen to the speeches of Sant Jarnail Singh Khalsa Bhindranwale. The June 1984 attack on Sri Darbar Sahib by the Indian Army deeply hurt and saddened Bhai Sahib and invoked the courage within Bhai Sahib to step forward in service of the Panth. Bhai Sahib continued with his higher education and received his diploma in civil engineering in 1987. During this time Bhai Sahib had become an active member of the Sikh Students Federation and had been blessed with Amrit at Mehta Chowk. Bhai Sahib was a very humble Sikh and serene individual, despite having contributed immensely to the SSF Jathebandi Bhai Sahib kept his actions anonymous. Bhia Harjeet Singh first came into the view of the police when his close associate Bhai Kuldeep Singh Dhillon was arrested. The local villagers along with members of the Sikh Students Federation held a protest on Dhilwan’s GT Road where traffic was brought to a halt for 8 hours. During this incident the police took special notice of Bhai Harjeet Singh, as it was he who quickly gathered hundreds of protestors onto the streets. Bhai Harjeet Singh was then also arrested and taken into custody. Bhai Sahib was ruthlessly tortured for several days and only after pressure from the local villagers was released. Being inhumanely tortured by the police did not dampen Bhai Sahib’s spirits, instead it made him more determined to take part in the Sikh struggle for Independence. Bhai Sahib’s worked very closely with Bhai Kanwarjeet Singh Sultanwind (KCF), Bhai Nirmal Singh, Bhai Kuldeep Singh Dhillon, Bhai Balwinder Singh Dhillon, Bhai Balbir Singh Khasan, Bhai Nirmal Singh Chotu and Bhai Surjeet Singh Sandhu. Together, this group punished many oppressors and perpetrators of crimes carried out against the Sikh nation. As Bhai Sahib was being watched closely by the Punjab Police, he gained employment as an engineer at Hussainpur coach factory, Kapurthala. This allowed Bhai Harjeet Singh to easily leave his village without arousing suspicion and continue with his Panthic duties. 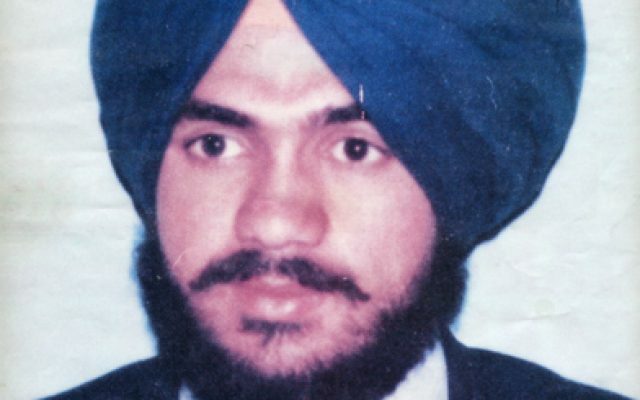 In April 1989, after being reported by a local police tout Bhai Sahib was once again arrested. Bhai Sahib was moved from jail to jail and the process of torture continued for a whole month however Bhai Sahib did not reveal a single shred of information relating to the whereabouts of his fellow Singhs. The police were once again forced to release Bhai Sahib after the local villagers along with local leaders protested against Bhai Sahib’s unlawful arrest. Bhai Sahib was tortured to such extent that he was left unable to walk for days. Once again despite the torture, Bhai Sahib remained in high spirits. Upon witnessing Bhai Sahib’s dedication to serving the Sikh Panth, he was held in high esteem by the locals. Once Bhai Sahib was fully fit, the police made attempts to arrest him again but Bhai Sahib managed to escape and forced to go underground. In 1990, through an agent Bhai Sahib reached Germany and a few months later moved to America. Even whilst living abroad Bhai Sahib continued with his Panthic obligations. Bhai Sahib assisted families of Shaheed Jujharoos, raised awareness of the ongoing struggle and kept in touch with the Jujharoos on the battlefields. Bhai Sahib’s 2 sisters and younger brother were all settled abroad and Bhai Sahib’s relatives wished he do the same, but Bhai Sahib’s priorities lay with the Panth and not self-progress. Bhai Sahib rejected the opportunity to live a life of luxury and returned back to Punjab in order to free the Sikh nation from the shackles of slavery. Bhai Harjeet Singh returned to Punjab in April 1992 and began working closely with Bhai Parmjeet Singh Panjwar, Bhai Daljit Singh Bittu, Shaheed Baba Davinder Singh ‘Singapore’ and Shaheed Bhai Rashpal Singh Pandra. Bhai Sahib’s actions where again completed in an anonymous manner whereby he punished many enemies of the Sikhs under the alias of Jagdeep Singh. Bhai Harjeet Singh’s aim was to strengthen the movement from all fronts, politically as well as martially and spread the movement to all 4 corners of Hindustan. Due to Bhai Harjeet Singh & Bhai Parmjeet Singh Panjwar’s efforts the movement extended itself across the borders of Panjab into neighbouring states and internationally via the contacts Bhai Sahib had established whilst living abroad. Bhai Sahib having eliminated a number of high level targets was on the radar of the Govt. Ultimately the fateful day arrived which each warrior awaits. On July 15, 1994 in a raid conducted by the Jalandhar police on a safe house where Bhai Sahib and his associate had setup camp, Bhai Harjeet Singh attained Shaheedi. Bhai Sahib’s body was removed and taken to village Dakhla, Jalandhar the following day and presented as a death resulting from a fire fight. Bhai Sahib was officially identified as Jagdeep Singh ‘Jaggi’. Thus Bhai Harjeet Singh Dhillon aka Jagdeep Singh ‘Amreeka’ departed from this world, but his vision and message remain intact which the Sikh Nation shall continue to protect until the final goal of a Sikh homeland has been accomplished.